These North shore residents desired a more accessible landscape for their recently purchased home. The existing deck and railing obstructed views from the kitchen and dinette. The narrow access point from the deck to the yard led guests to damp, wet grass and was not in proportion with the scale of the deck or the home. 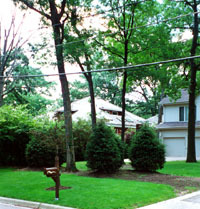 The yard featured a unique and healthy stand of oaks which provide filtered shade in the summer, but also a challenge in the specification of landscape plant material. The priority of the rear landscape design was to increase the accessibility of the lawn area from the deck (which was to remain). A new, at grade flagstone patio was installed creating a focal point from both inside the home, as well as from existing seating areas on the deck. Chaise lounge chairs, potted annuals, and a flagstone stepper walk connects this new patio with a new flagstone landing that wraps the corner deck stairs. Flagstone steppers connect the homes front entrance to the new rear patio spaces, so guests walk solely on hard surfaces to gain access to the rear yard, patios and deck. The front driveway area is one of the few sunny areas of the yard. The new plantings take advantage of this as ornamental grasses, flowering perennials, and stone give guests a first impression of the natural landscape that adorns the property. Clean sweeping bedlines are crisply defined and filled with groundcover to complete the lush, full look of the landscape.